There are so many procedures that repair damaged teeth today. So… how do you choose? With the help of our knowledgeable and friendly dental staff here at Fine Dentistry, that’s how! We are only too happy to provide you with a number of alternatives to treat your specific condition. To arrange a consultation, please call our office, and get ready to explore all your options for decayed, damaged, chipped, broken, uneven and worn teeth! We have lots of choices to offer! Inlays, Onlays – What’s the Difference? 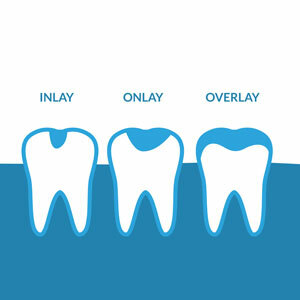 You may have heard of dental inlays and onlays – but do you know what they are? Inlays and onlays are used to repair decay on the chewing surfaces of your rear teeth (molars). They can also be used to repair teeth that don’t have enough damage to apply a crown. Inlays and onlays are made from tooth-colored porcelain, composite resin or even gold! Inlays are custom-fitted to repair decay or damage in the ridges of the teeth; onlays, also custom-fitted, are used to repair decay and damage that occurs on more than one cusp (point) of the tooth. Each tooth has four points or cusps. Inlays and onlays look very natural, so no one even knows they’re not your real teeth! They are also strong and durable – necessary qualities for those busy back molars! We understand that you can easily become confused with the many options available today to enhance and restore your teeth– and new advancements in technology keep all of us on our toes! That’s why we’re here to answer your questions and to help you decide what’s best for your particular situation. Please schedule an appointment so we can discuss your concerns and explore all your options. We’re standing by, just waiting for your call!